The Pre-kindergarten program is child-centered, emphasizing education of the whole child—intellectual, emotional, and physical. Education is experience-based, interdisciplinary, and collaborative. The focus is on the process of learning. We use classroom organizations and teaching strategies that encourage children to interact with one another and their environment so that they learn to function as members of a community, make meaning of their discoveries, and become lifelong learners. The Pre-kindergarten program develops basic skills in language arts, math, science, and social studies through a child-centered approach in which the children participate in decisions about the path of the curriculum. This leads to authenticity of the learning experience, thereby fostering a sense of ownership, generating excitement, and stimulating intellectual curiosity. Pre-kindergarten children develop emergent literacy skills and print concepts in all areas of the curriculum. 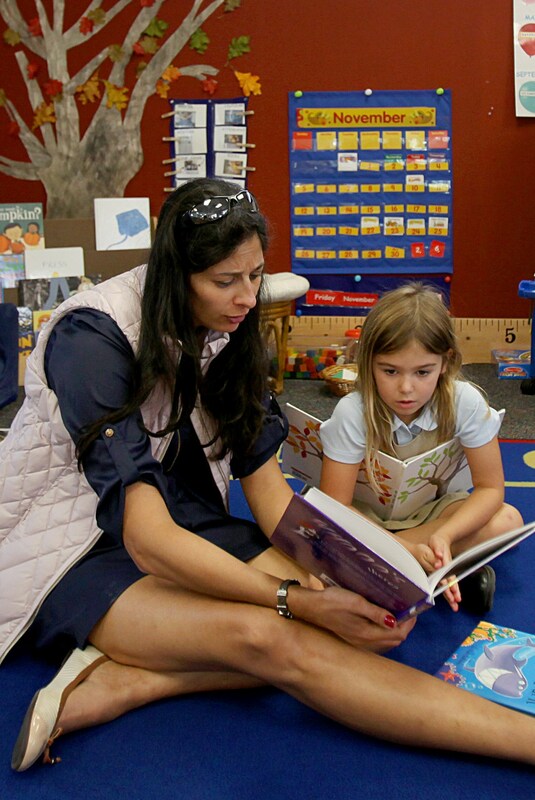 Books are placed in various areas of the classroom and children are free to visit those areas throughout the day. They develop a basic understanding of the idea that print carries meaning, and they learn to visually track from left to right, to recognize picture cues and patterns, and to predict what will happen next in a story. The children also learn how to identify and write the letters of the alphabet, and they develop phonemic awareness and a beginning understanding of symbol/sound correspondence. Writing is also emphasized, and children are encouraged to write in many areas of the classroom. Many opportunities for children to practice their speaking and listening skills are also provided. The children listen to stories read aloud, dictate messages to teachers, sing, rhyme, label pictures, and use expressive language during play. Concrete and active experiences in math provide Pre-kindergarten children with a solid foundation for future abstract mathematical thinking. Counting, numerical relations, ordering, measuring, sorting, classifying, estimating, and patterning are all part of the children’s mathematical experiences. In their work with materials such as unit blocks, pegboards, pattern blocks, cubes, and games, Pre-kindergarten students are actively involved in learning math every day. In social studies, Pre-kindergarten students explore the concepts of family, friendship, responsibility, and membership in a community. They develop socially and emotionally throughout the day and learn how to be both leaders and followers. Children learn about differences and how each person or family is unique. They gain a stronger sense of self and an understanding of others. Through daily routines and jobs, students gain self-confidence, independence, and a sense of competence. Teachers encourage Pre-kindergarten students to explore the natural and physical world around them. Science is included in all areas of the classroom. Children make observations and predictions throughout their daily activities, and teachers foster their natural curiosity.